I'm Jeff with Kentucky Indiana Web Group. Not only I'm LOCAL, VERY affordable. But quick and very detailed in ALL my projects. 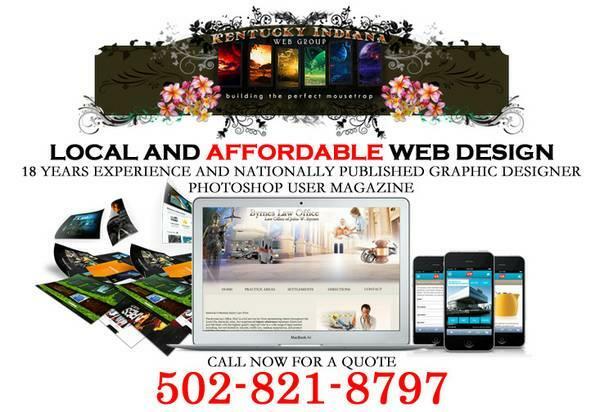 I'm located in Louisville, Ky.
Why waste your good hard earned money on a designer that their websites not only look cheap, but quickly made from templates? We don't use templates here. Each and every website is designed from scratch, from the ground up. Custom to best fit YOUR needs. I've also been published in a nationally and a worldwide recognized magazine, Photoshop User magazine. Who better to handle your project that is not only experienced, but extremely talented and cheap? Most of my websites designed are $399. But, you will get a VERY fair price and will NOT bust your budget. Plus, we've have designed everything from very simple, but yet highly designed websites, geared up, specifically to reach your customers to extremely high complexed websites with content management systems, e-commerce solutions, multiple scripts to handle every needs. What is the $399 deal? 4. Logo Template for Hats, shirts, letterheads for your business. Plus, if you host with us $100 for the year. You get unlimited disk space, uncapped, super fast websites. You're not also thrown on a server with 10,000 other websites, like Go Daddy webhosting and others.